This is the 6th of twenty-one lessons for design students, gathered from the combined experience of being a student, and teaching students. I will published one lesson each weekday until they’re done. A good idea must work in diagram, drawing and model. If it fails in even one of these, throw it out and start again. This is actually two lessons in one. First, it is a lesson about ideas. You’ll have many ideas during the creation of your project this semester, but how to know whether they’re any good? Testing them in these different modes of documentation is a good way to start. You will need to be disciplined to do so thoroughly, but diagramming then drawing then modelling will give an idea both robustness and clarity. It will help you both develop it and distill it. Second, it is a lesson about the tools of the architect’s trade. We are a visual profession, our common language is one we produce with our hands. This truth is as relevant in practice as it is at university. Every single meeting I ever have takes place with a set of drawings on the table and pens in everyone’s hands. It doesn’t matter if I’m meeting with another architect, an engineer, a builder or a client. I might be marking up a floor plan, sketching a structural layout, nutting out a construction detail or presenting a sketch design model. For all of these tasks, I rely on visual media. In all of them, I speak with pictures not words. 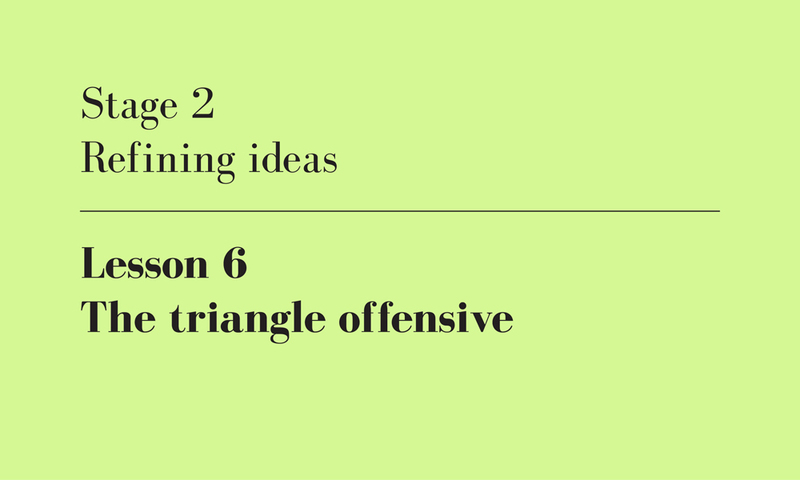 The triangle offensive, author’s own image.